Real estate agents around the county often have to explain to their clients why a Zestimate is not the most accurate source to assess the value of a home they’re looking to sell or purchase. Zillow does not know, and cannot know, the specific characteristics of neighborhoods or homes that can affect the home value – e.g., does the home back up to an undesirable neighborhood, does the home show well or is it in disrepair compared to other homes in the neighborhood, does it have upgrades, does the home smell? Zillow simply pulls data from a number of sources, many of which may not be accurate. It’s also common that the information Zillow provides is out of date – homes may be listed as active but were sold or taken off the market months before. Zillow also does not pull records directly from the MLS (Multiple Listing Service). Much of the listing information on Zillow is uploaded by real estate agents, so if the agent doesn’t input correct information, the data displayed can be incorrect. Garbage in, garbage out. So how does a homeowner or buyer accurately determine the value of a home they’re looking to buy or sell? The first step is to contact a local professional real estate agent that knows the specific neighborhood and the most current market values. Most agents will create a free CMA (Comparable Market Analysis) on your home that will be much more accurate than a Zestimate. While a CMA is not a formal appraisal like the one you would receive from a professional appraiser paid for by a lender, it is an accurate estimate of your home value as it relates to other recent home sales in your neighborhood and takes into account the total condition of your home, including upgrades and other specifics. Also, unlike Zillow, the information an agent accesses to create a CMA is pulled directly from the MLS. An accurate CMA is then used as a solid foundation to create a realistic pricing/offer strategy to purchase or sell a client’s home quickly at the best possible price. Bottom line, beware of Zestimates… While it’s fun to get an instant value on a home that you’re looking to buy or sell, remember that real estate professionals know that Zestimates are notoriously inaccurate and misleading and they will never rely on a Zestimate to determine the real sales or purchase price… If you want to get an accurate home value estimate, let an experienced agent provide you a free CMA. You’ll be glad you did! Moving is acknowledged as among the most stressful experiences in a person’s life.The prospect of packing up a beloved home, with decades of accumulated belongings and all the memories attached, can seem overwhelming. And, with aging parents this can be a particularly daunting task. Leaving a family home can be a bittersweet event that involves revisiting many joyful and sometimes painful memories. During the process of downsizing we may be surprised at how attached we have become to our possessions and how difficult it might seem to part with them. In many cases, possessions have been accumulated over a number of years and not everything can (or should) be moved. What results is the need to sift, sort, donate, and dispose of a variety of personal items. Here are some useful downsizing tips. Start with the rooms you use the least: Begin the sorting process in these rooms and avoid cluttering the areas of the home used regularly. Measure the items you want to take with you: Do they fit in your new home? Create a sorting system: Sort items by using stickers, making piles, or making detailed lists of what will be kept, what will be given away and what is still undecided. Write down family history: Take the time to write down special memories or any family history that is connected to special items. Do you have a height wall in your house? Take a picture of the wall before you paint over it. You can even make short narrated videos of special items. Work in scheduled blocks of time: Plan to sort items for periods of no more than two hours at a time. The process of revisiting memories and making decisions about items you have lived with for many years can be emotionally exhausting. Start early and don’t rush yourself: Be sure to plan plenty of time for the sifting and sorting process. Take moments to laugh at old pictures, read old letters, and grieve for losses. If you can’t decide what to do with an item, set it aside and return to it later. Now what do I do with all this stuff? Identify those items you want certain family members to have and consider giving them now. Get rid of things you no longer need: Be realistic about what items you use regularly and what items you are just used to having around. Consider having a garage sale or home auction: Having enough items that are likely to net a profit (furniture, antiques, electronics) may make the effort of having a garage sale worthwhile. If you have items of value, you can hire a service agency to catalog and appraise your possessions and coordinate a home auction for a percentage of the profit. Donate to charity: For those items you cannot give away as gifts or sell for profit, make a tax-deductible donation to charity. Many charities will pick-up donated items. Consider thinking of specific organizations for specific items… for example, donating your professional wardrobe to an abused women’s shelter or giving old musical instruments to a school music program. If you or your parents are thinking of downsizing, consult with a Realtor that specializes in senior real estate assistance services and has a SRES (Senior Real Estate Specialist) certification. When you’re investing in a home remodeling project, you want to make sure that the results not only please you but add value to your home and save you money. Never is that more true than in a kitchen remodel, where costs can added up so quickly that your budget can all of a sudden seem like pennies in a jar. To avoid that and keep costs in line, and yet still get the kitchen of your dreams, here are a few of my favorite ways of getting the most out of a tight budget. 1. Go with ready-to-assemble cabinets. The biggest cost in a kitchen remodel is new cabinets. The most expensive option is going custom, for which the cabinetry is designed, built and installed to specifically fit your space. 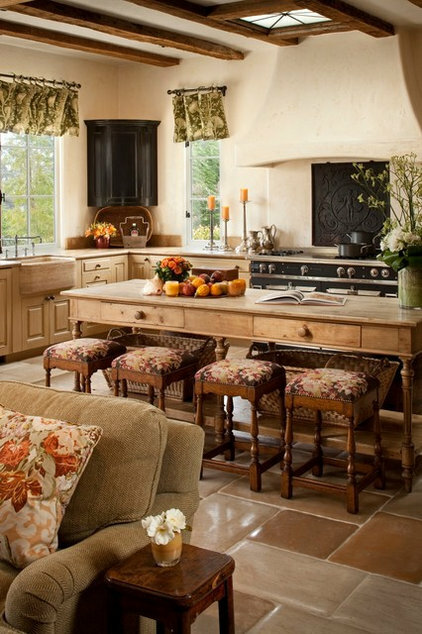 Exotic woods, ornate details and period styles will add to the cost and delivery time but result in a one-of-a-kind kitchen. Custom cabinets can cost $10,000 to $60,000, as cabinets can range from $250 to $1,500 per linear foot. If your budget doesn’t allow for custom, but you need new cabinets, ready-to-assemble (RTA) is a good option. Ready-to-assemble or semicustom cabinets can sometimes be half the cost, from around $125 to $900 per linear foot depending on the material, style and cost of installation. If you are a do-it-yourselfer, you can assemble these yourself; if not you will need to hire a contractor. Semicustom cabinets are selected from existing designs and are prefabricated offsite in standard sizes, with limited options in terms of sizing, styles, materials and finishes. In-stock cabinets are for customers who want to grab their cabinets right off the shelf and get going. These stock cabinets come in standard sizes, shapes and colors. Since the cabinet dimensions are not based on your kitchen, space-wasting fillers may be required to make the cabinets fit. These cabinets are very affordable for remodelers on a budget. Cabinets can range from $75 to $400 per linear foot. Keep in mind, though, that costs will vary by location. 2. Keep existing cabinets if possible. 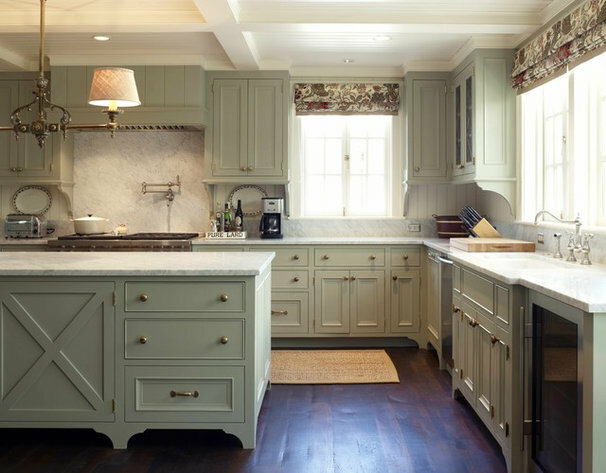 If your cabinets are good quality and you like the style, resurfacing is a great option. 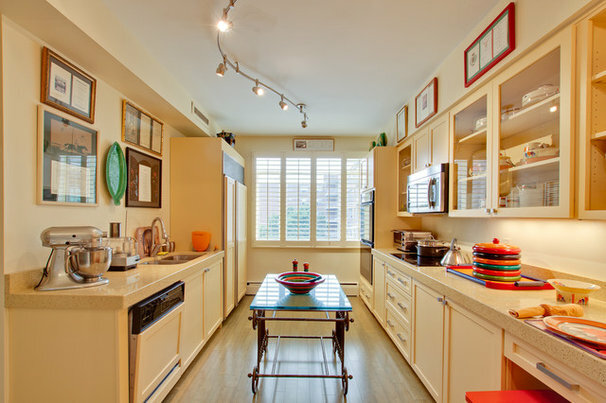 It’s amazing how color can transform a kitchen and a few coats of paint can give life to a once-drab space. Resurfacing and painting make for the most cost-effective option, but ensure that you take the steps needed to get a beautiful finish. A simple paint job might cost a few hundred dollars. But for a more extensive refacing job, $5,000 to $15,000 is likely if new veneer is added to the face of the cabinets. 3. Choose open shelving where possible. Open shelving creates interest in the space as well as saves money. Using salvaged wood or painted planks from your local hardware store for shelving is a cost-effective and functional option to display everyday dishes (items that don’t spend enough time on the shelf to accumulate dust). Open shelving can save a few thousand dollars, but while it may be tempting to do away with fitted cabinets altogether, they’re still valuable and efficient for storage, particularly if you have a small kitchen and a lot to pack into it. 4. Consider alternative countertop materials. There is a wide range of countertops to choose from — solid surfaces, recyclable products, concrete, tile, stone and more. Granite is still a popular choice for countertops, but at $50 to $100 or more per square foot installed, it can push any budget over the top. Consider using two different surfaces instead, such as making the outside perimeter butcher block and the island granite. This can cut the cost in half. If granite is not in the budget but you like the look of stone, consider laminate, an inexpensive alternative. The costs ranges from $8 to $20 per square foot, including installation. Laminate has come a long way with its high-definition selections and new cut-edge profiles. The new laminates look so much like stone, you could be easily fooled. 5. Keep appliances where they are. If your plan is to get new cabinets, think about keeping your appliances where they are. Moving the mechanics and electrical for appliances can be costly, not to mention the ceiling on the floor below and the walls may need to be cut into to expose the mechanicals. These are costs that many homeowners don’t think about when planning a kitchen remodel. Keeping the appliances where they are will save you thousands of dollars. More often than not, moving an appliance 1 foot costs as much as moving it 6 feet, depending on where the mechanicals are located. 6. Look at different options for islands. A 6-foot island with new cabinets can run $800 and up. 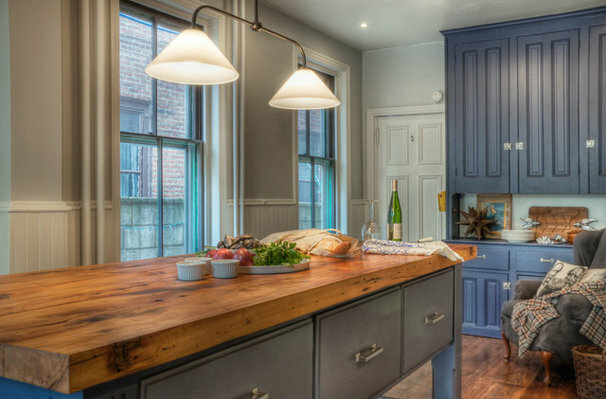 Instead of using cabinets for your kitchen island, think of repurposing a piece of furniture. An old table or a dresser is a great alternative to bring unique character into the space. Keep an eye on Craigslist, the Houzz Shop, salvage stores, estate sales and garage sales. Depending on how resourceful you are, you can save yourself hundreds of dollars. 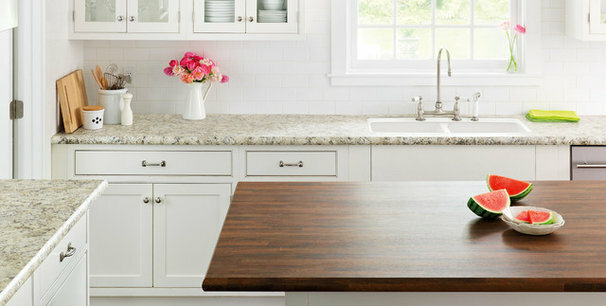 Tip: When looking for a piece, make sure it is countertop height (36 inches). 7. Opt for a cutout rather than removing a wall. 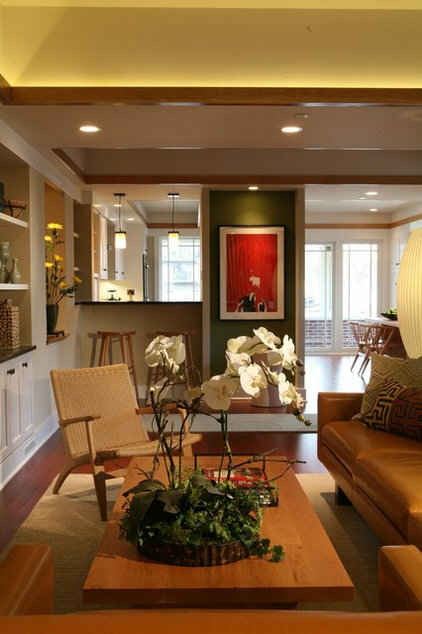 Many homeowners want to open the space between the kitchen and their family room to create an open floor plan. When removing a wall, there are many things to consider. Is it load bearing? Does it have venting, water pipes or electrical running through it, which will need to be rerouted? After removing a wall, the ceiling, other walls and floor may need to be cut into and repaired. A less expensive option to consider is a cutout. Not only does it open a room, but it can provide extra countertop space and an area for additional seating. You will still need to check for mechanics and plumbing, but the floor and ceiling will not need to be repaired, which will save you money. 8. Try track lighting instead of recessed lighting. Adding recessed lighting can become a bigger project than planned. Holes need to be cut into the ceiling, electrical wiring needs to be added, and there may be hidden costs in repairing the ceiling. The overall cost for a single recessed light is $100 to $150, including the costs for materials and an electrician. This can add up quickly. To keep costs down, think about track lighting. There are many styles, shapes and finishes. 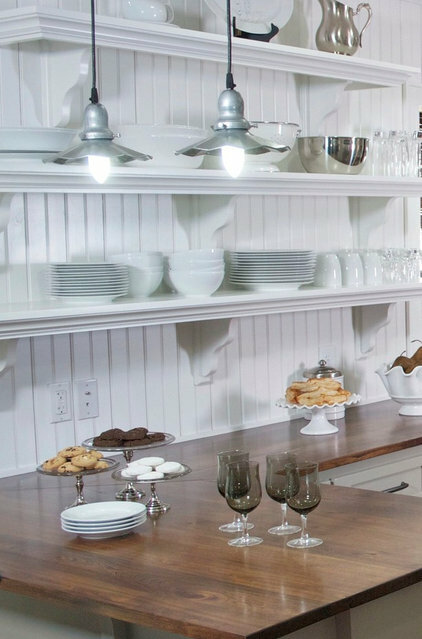 They give off plenty of light for tasks in the kitchen and, when placed on a dimmer, give off a nice ambient light. 9. Think about doing your remodel in stages. If you’re on a low budget, wait to do a few projects at a later date. This will spread out the remodel costs, allowing you to save for that next project. Backsplashes can be put up anytime after your countertops and cabinets have been installed. If you can’t stand looking at Sheetrock, think about wallpaper, an easy project that’s also easy on the wallet. Adding glass to your cabinet doors is a project that can be done anytime that’s simple and low cost. Changing out hardware is one project that can cost hundreds. If the new hardware works with the current hole placement on your cabinet doors and drawers, you can hold off on replacing it at a later date. There is no hard and fast rule, but there are some general guidelines that apply to most homes. For example, each year the National Association of Realtors publishes the Cost vs. Value Report with Remodeling Magazine, which features various home project costs and returns in four regions, including a national average. If your sub-floor is plywood, then replace the carpeting with light tan. Neutral carpeting is your best bet for resale. Replace chipped or cracked tiles. Clean or replace the grout. But don’t install ceramic (it’s too expensive) unless it’s for aesthetic reasons in an entry way. Buyers spend more time than you would think staring at ceilings. They are looking for signs of a leaky roof, but what you don’t want them to see are stains from grease or smoke and ceiling cracks. Ditto for walls. Nothing says freshness like new paint, and it’s the most cost effective improvement. Use fiberglass tape on large cracks, cover with joint compound and sand. Paint a neutral color such as light tan. It’s not that all buyers hate wallpaper. They hate your wallpaper – because it’s your personal choice, not theirs. And they hate all dated wallpaper. Get rid of it. The easiest way is to steam it off by using an inexpensive wallpaper remover steamer. Even if your wood paneling is not real wood but composite, you can paint it. Dated paneling must go. Older wood paneling such as walnut, mahogany, cedar and pine, has gone out of style. Paint it a neutral and soft color after priming it. Older popcorn ceilings with the “sparkles” often contain asbestos and if disturbed are health hazards. Say goodbye to it. But even recently sprayed ceilings turn off buyers. It’s not expensive but it is time consuming to remove. Lay down drop cloths and scrape it off. You will need to repaint. 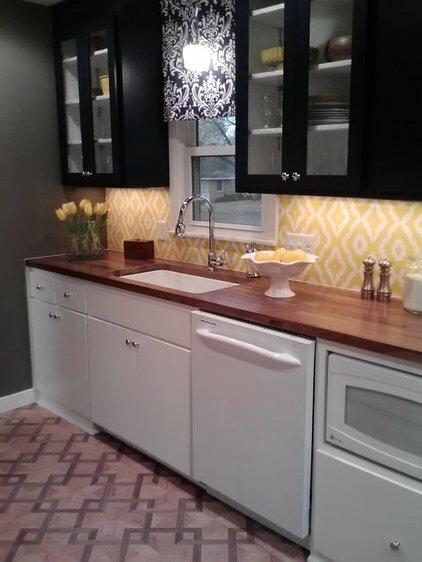 Kitchen remodels return nearly 100%. According to Remodeling Magazine, the high-end kitchens don’t return as much as the mid-range or minor kitchen remodels. Most buyers won’t pay extra for a built-in Sub Zero refrigerator, professional 8-burner stove, undermount sink or travertine floors. Resurfacing is your least expensive option. This involves attaching a thin veneer to the surface of the cabinets and replacing the doors and hardware. If your cabinets are painted, add a fresh coat of paint and new hardware. Granite counters are not always necessary, but ask your agent. Simple laminates, newer faucets and sparkling sinks will also sell. Buyers don’t want to spot leaky faucets or stained sinks. The national average of recouped cost is more than 100% for bathrooms. New floors, fixtures and lights payoff. If your home needs a new roof, bite the bullet and do it. Even though most roofing tear-off jobs take one to two days, buyers shy away from buying a home if the roof needs to be replaced. Overall, buyers want to buy a home that has no deferred maintenance, newer appliances, updated plumbing, electrical and heating (including a/c), modern conveniences and is ready to occupy. Use of drones (aka unmanned aerial vehicles) is becoming quite popular among Realtors who want to show off their clients’ homes and neighborhoods in a unique way…from the air. This is especially true for larger homes with acreage. However, as you might have seen from the recent drone incident at the White House yesterday, the FAA is scrambling to deal with how to regulate drones and drone usage among the general population who enjoy flying drones for sport, and commercial photographers, some of whom support real estate professionals. Bottom line, the FAA has prohibited the use of drones for real estate marketing, at least for the time being. The use of drones for such purposes may lead to the assessment of substantial fines and penalties, according to the National Association of Realtors (NAR) Board of Directors. NAR added that they support efforts to create new federal regulations to allow for the future commercial use of unmanned aerial vehicle technology by the real estate industry. The FAA Modernization and Reform Act of 2012 tasked the FAA with implementing clear-cut regulations allowing for the commercial use of UAVs, by no later than September 30, 2015. So, if you’re a homeowner who is looking to create aerial photography of your home, you may have to wait to legally hire a drone photographer. Every seller wants their home to sell quickly AND at top dollar, however it’s not luck that makes that happen. Here are seven helpful tips to prepare your home for a successful sale. Say to yourself, I’m not selling my home; I’m selling a house.” Buyers are looking at your home through their own eyes. What you think your home is worth is not always what they feel is a good value based on its condition or décor. Listen to your real estate agent’s advice on preparing your home for showing and how to price it to sell. People collect an amazing amount of junk and the longer you’ve lived at your house the more junk you seem to have. If you haven’t used an item in over a year, you probably don’t need it. Think of this process as your head-start on packing for your move. If the chandelier in the dining room once belonged to your grandmother, take it down before the buyer sees it and falls in love with it. Look in your bathrooms and re-caulk and grout if needed. Repair all wood rot and make sure to replace all burned out light bulbs. Have windows professionally cleaned…you will be amazed what clean windows will do for a house! Make sure the siding and deck are pressure washed. Remove all cobwebs and dust on all ceiling fans and light fixtures. Clean out any musty-smelling areas. Odors are a no-no. Here’s a Realtor’s secret… place small bowls of whole coffee beans around the house to get rid of odors. It really works! Does the house welcome you? Do you have curb appeal? Many buyers won’t get out of the car if they don’t like the exterior of your home. Make sure your bushes and trees are trimmed and repaint faded window trim. These tips were developed to help you understand your rights and obligations as a renter generally. Your rights and obligations are most often determined by the terms of your lease and laws that vary greatly among the states and provinces. Call a qualified attorney who can review the lease document BEFORE you sign it and explain your rights and obligations. Understand the terms of your lease before you sign. One common mistake renters make is signing a lease without fully understanding their rights and responsibilities. Leases are written by attorneys representing your landlord, not you. It is advisable to have your own attorney review your lease before signing it. An experienced real estate agent is also someone who can help you review and negotiate your lease. Purchase renters insurance. In the event of a disaster, your landlord’s insurance may only cover the property the landlord owns. Renters insurance is generally affordable and offers protection not only for your personal belongings, but also against many personal injury claims that occur on or near your rental property. Your landlord may be responsible for making repairs in a timely fashion and for keeping the premises safe and in compliance with health and other codes. However, the landlord’s responsibility varies depending on the terms of the lease and state or provincial laws. Always consult with your attorney and ask them to review the lease with you. In most cases a landlord must give you notice before entering your home. However, this may be subject to change depending upon the language of your lease or the local laws that apply to it. Never stop paying rent to settle a dispute with your landlord. If you believe that you have a claim against your landlord, you may not be entitled to withhold your rent. Always talk to your attorney immediately if you have a dispute with your landlord. Even if you have a legitimate claim against your landlord, the landlord may still be entitled to evict you if you do not pay your rent. Under most circumstances, your landlord cannot take your property, change your locks or turn off your utilities merely because you failed to pay rent. However, the landlord may be able to file eviction proceedings against you in court. Call your attorney if you have any dispute with your landlord. Do not break a lease without understanding your rights and responsibilities. In some rare instances tenants can break a lease without notice, but laws vary and it is important to understand the proper procedure for breaking your lease. If you need to get out of your lease before it expires, call your attorney first. Generally, the landlord’s cost for repairing normal wear and tear cannot be deducted from your security deposit. Before moving into and out of a rental property, take detailed pictures of each room. Before and after pictures may be helpful if the landlord claims damages you did not cause. Your landlord must return your deposit in a reasonable amount of time. Specific time frames may vary.